It may not be every person’s first choice, but hog roasting has been steadily gaining in popularity over the years: at hog roast Ampthill we are certain this is because in these difficult times hog roasting is a brilliant and cost effective way to feed large numbers of people with delicious and nutritious food. Of course when you book with hog roast Ampthill to cater for your event, you don’t just get a cost effective way to feed people, you also get our excellent service and mouth-watering, tender meats roasted to succulent perfection. We have been in the hog roasting business for many years and think we really understand what it takes to create not only the best tasting roasts, but the most elegant banquets that are suitable for a wide range of formal functions from corporate parties to wedding receptions. When you decide on hog roast Ampthill for your function, we will take care of even the smallest detail, so you can be free to mingle with your guests and enjoy the day. We have a great team who work effectively together to assemble our equipment and dress tables with imaginative flare and elegance. While you sit down at the tables and enjoy the company, our chefs will work to prepare your sumptuous feast of tender meats, sauces and salads. 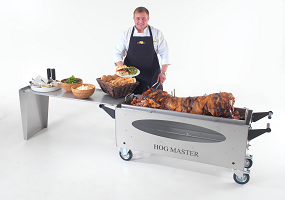 Our hog roasts also work equally well at less formal events where the pageantry isn’t necessarily required. Even without the elegant trimmings a really good hog roast such as we provide makes for an entertaining spectacle. It may be in your garden at home, it may be outside your local pub, or on your schools sports field; wherever the event the hog roast lends a unique style of its own. You can just imagine a whole pig slowly rotating on the spit roast, its delicate aromas filling the air while the crispy crackling gradually changes colour to a deep caramel brown. All our whole roasted pigs are served with our own warm, herby stuffing; a zingy apple sauce which works beautifully with the subtle flavours of the meat and of course there is always oodles of delicious crackling to go around. At Hog Roast Ampthill we are so dedicated to this incredible method of cooking great food that we decided to offer our custom designed ovens for hire. Because we are professional caterers ourselves and have in the past used less than efficient machines, a lot of care went into the design of our ovens. We had to take a number of things into account: mobility was a major issue; the machines had to be easily transportable over different surfaces, so we incorporated four strong wheels into the design. Now there is no problem with getting them to the designated venue whether it’s tarmac, grass or hard standing. Of course it wouldn’t be much use being able to get the machines to the venue’s if they didn’t fit through the doors! So they are designed to fit through standard doorways. Hog Roast Hire Ampthill also wanted to be sure the ovens would be as versatile as possible in order to cater for as wide a range of tastes as possible. For this reason we have designed several tools and attachments to make cooking a number of dishes simultaneously feasible. The spit roast rod with fully motorised rotor means a whole pig or, lamb can cook steadily away, while the grill tray underneath allows for burgers, kebabs, sausages and any number of other barbeque type foods to cook at the same time. The grill has also been designed to accommodate several pans which can be used for sauces or vegetables. And if all this wasn’t enough, the larger of our two ovens can cook up to 35 rotisserie style chickens, while the smaller can easily accommodate up to 15 chickens. All this comes in a sleek casing made from tough stainless steel for ease of maintenance and a pleasing look. And for your peace of mind, all of our ovens are fully CE certified, because we take safety as seriously as you do! With all these considerations taken into account hog roast hire Ampthill are certain that when you hire one of our machines your roasts, sauces and vegetables will turn out every bit as successfully as ours do! And what could be nicer than gathering your family and friends around and sharing with them a meal of excellence that you have lovingly prepared with the help of one of our top quality roasting ovens.